The Society for Collegiate Journalists is pleased to announce the winners of its major awards. 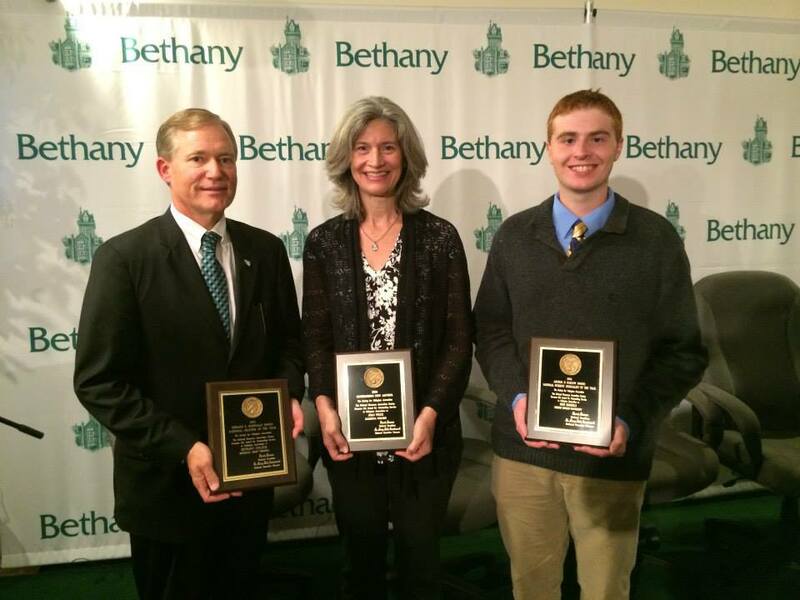 Major award winners: Dr. Scott D. Miller, president of Bethany College, accepts the award for Outstanding Chapter (Bethany College); Dr. Joan Price, Marietta College, for Outstanding New Adviser, and Nick Buzzelli, for Student Journalist of the Year. Awards were presented at the 2014 SCJ Biennial Conference at Bethany College, West Virginia. The award is named for longtime SCJ Executive Director Arthur H. Barlow. This award is based on outstanding contributions to college journalism. It is designed to allow SCJ chapter advisers an opportunity to bring national recognition to a student journalist who meets the highest standards of ethics, service, leadership and technical skills. The winners also receive a $500 prize from National SCJ. The 2013 Arthur H. Barlow Award for Student Journalist of the Year goes to Nicholas Buzzelli. Nick was nominated by Anthony Moretti, Robert Morris University SCJ adviser. SCJ Past President and former Executive Director Arthur Barlow made the selection. In the nomination materials, Moretti wrote, “He (Nick) mentors… new staff members to ensure they are comfortable in their new roles, adjusting to being reporters and gain confidence in their journalistic abilities. This award recognizes the commitment and contribution the adviser makes to an SCJ Chapter. It is named for longtime SCJ National Council member and Past President, Sheridan C. Barker. Excellent SCJ chapters thrive and endure because of the commitment of the SCJ adviser. The adviser is a mentor and a facilitator, a motivator and a link to the chapter’s past and the national organization’s future. The Barker Award recognizes such individuals who are the foundation of our national organization. It is a citation of lifelong achievement. This year’s Barker award winner is Robert Noll, the SCJ chapter adviser at John Carroll University. SCJ Executive Director Mary Beth Earnheardt made the nomination. This award is given to an adviser who has advised a chapter (new or existing) for a period of no longer than 6 years and no shorter than 2 years. The purpose of this award is to recognize a new and energetic member of the SCJ family. This year the recipient of this award is Joan Price from Marietta College. SCJ Executive Director Mary Beth Earnheardt nominated Price. Edward E. McDonald spent 15 years of his retirement working tirelessly as national secretary-treasurer of Pi Delta Epsilon; the organization merged with Alpha Phi Gamma in 1975 to become SCJ. This award, in his memory, is given to a chapter that upholds the highest ideals of college student journalism. It is awarded to a long-standing chapter. This year the Bethany College chapter is our McDonald Award winner. Former SCJ Executive Director Arthur H. Barlow and Executive Director Mary Beth Earnheardt made the nomination. This award is given to a chapter that has been chartered or reactivated for a period no longer than 6 years and no shorter than 2 years. The purpose of this award is to recognize a new and energetic member of the SCJ family. This year the recipient is Savannah College of Art and Design – Atlanta. SCJ Executive Director Mary Beth Earnheardt made the nomination. This SCJ Award recognizes a special and courageous contribution to student journalism. It is named for the “great one” of collegiate journalism, Louis Ingelhart. It is the only SCJ Award that may be awarded to non-members and it carries a $500 prize from National SCJ. This year the award goes to Gene Policinski. Andrea Frantz, SCJ Second Vice President nominated Policinski. Frantz wrote, “It is with pleasure that I nominate Gene Policinski for the 2014 SCJ Louis Ingelhart Award. His credentials are indisputable: Chief Operating Officer of the Newseum Institute, Senior Vice President of the First Amendment Center, and a regular First Amendment champion in sessions he has delivered to countless students and advisors at CMA. Whether he is writing about current First Amendment challenges in an op-ed, hosting a rousing “Freedom Sings” concert, or educating teachers in First Amendment bootcamp workshops, Gene is one of the nation’s foremost voices on the five freedoms guaranteed by the First Amendment and their importance to our democracy.